Bill Johnson was known as "The Cowboy Serenader". His real name was WIlliam Bryan Johnson, named after his two grandfathers. His family had quite a musical background. His mother, Geneva, had the singing talents in the family, playing the organ and singing in the Methodist Church for many years. His father, Lou, palyed the steel and straight guitars and played in string bands all over Kentucky. He had four uncles on his mother's side who had their own singing quartet. Bill's mother died when he was only ten years old. He went to stay with relatives in Oklahoma. It was doing the regular chores at the ranch there that he learned to be a straight shooter with both a pistol and rifle. He used his shooting talents as part of his stage act. It was said he could shoot a quarter out of someone's hands at 25 yards! By May 1946, he had already been appearing on radio for 20 years. In fact, they wrote that he had only been off the air 11 months in all that time. In 1946, he was out doing vaudeville and radio shows. During his stint at WAAT in Newark, New Jersey, he got a 30 foot by 1.5 foot fan letter. Bill had worked with many of the established acts in the entertainment business. He appeared with the National Barn Dance gang, at the New York World's Fair (in 1940, he broadcast his own radio show from there), Eddie Cantor, Morton Downey, Nick Kenny, Dave Elman, Johnny Marvin and more. 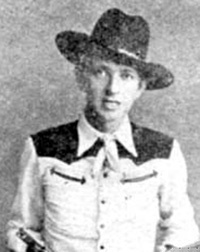 He also appeared in a catalog of western wear for the Fay Ward store in New York City. He seemed to be quite a character. They said he liked to stay up til the wee hours of the morning rading murder mystery stories. He said if there wasn't at least ten people murdered on the very first page, he wouldn't read the story. He was teamed up with a buddy of his at the time, Ken Oakley who played the fiddle, bass, guitar and sang and yodeled, too. They had been appearing together at the time for nearly over six years. They tried to form a band, but couldn't find an accordion player in that part of the country who could play the honest-to-goodness hillbilly music. He had his own songbook published as many artists did back then, published by the Dixie Music Company out of New York City. National Hillbilly News, May 1946; Poster Show Print Co., Huntington, WV.